Because I'm always starstruck over plain ol` blogs that dabble in trinkets like coffee mugs and t-shirts, it's hard to come up with originality in devising something that'll help to advertise my blog (my calligraphy, illustration skills). I mean, coffee mugs and t's seem to be doing to the trick for many bloggers out there, so why not me? Silkscreen is a print method that not even bloggers seem to be familiar with, but when I last took a workshop for a zinester convention, silkscreen techniques were also highly praised as a method to produce print. It must've been several months that I picked up a small kit from Swains and I'm just now opening the box. I thought of just slapping any old image to gain some familiarity with the process of it all, but you know me. I have to do things with luster; so I've been trying to come up with concepts and slogans (captions) to impose on my first silkscreen. It wasn't until the modem broke down and left me w/o a DSL signal that I began to really scrutinize what exactly this short phrase was trying to say. It makes no sense. 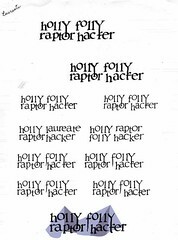 I had been playing around with distorting the letters so that they mesh in with the word below it, but I didn't quite mean for it to say "Holly raptor, folly hacker", which to me makes a little more sense. Just the holly raptor by itself would be enough to convey the picture of a vulture wearing a crowned wreath (image not shown), wouldn't it? You will see that on this illustration page, I was pondering the idea of replacing the word folly for laureate. While I don't think I'll spend more time in emphasizing the word order so that it's clearly read as "holly raptor,…", I am interested in making this line of text hand printed. It's stubborn of me, I know, especially seeing that I have software to manipulate letters to make them shine. I don't know what else I could do to justify the hokey idea of making this project entirely by hand. On the one hand, I don't feel confident enough to pursue a professional look in exchange for abandoning the label of "handcrafted", and on the other hand, I don't want to spend more time than I have to to make this look sincere. Bottom line, I'm going to digitize it anyway to get effective half tones; so might as well tweak the lettering in illustrator.